In the previous blogs we looked at the option to use Linked Analysis and we even used the capability of Linked Dimensions, so that any filter or selection in our charts would impact all the charts in our story, but we kept the data from our two data models in two separate charts. 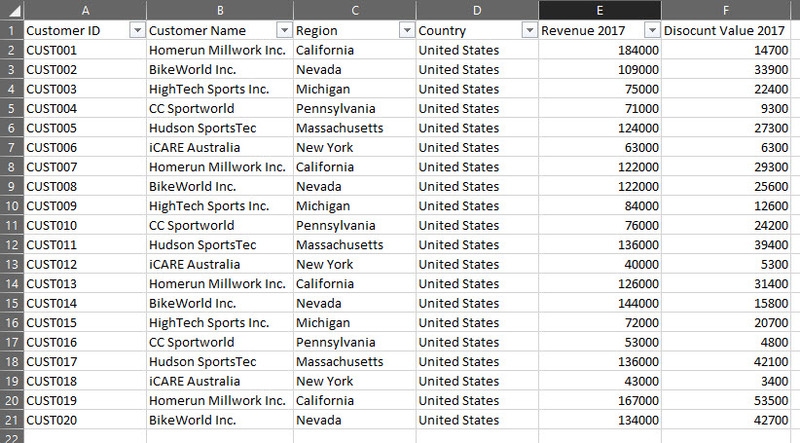 Now this time we are going to use blending and will combine the information from two data source into a single chart and will discuss the different options of linking and also the different scenarios in regards too formulas and aggregation. Lets start with our data sets and what we trying to achieve. Our first data set shows our customers with Region and Country as Dimensions and we have the Revenue and the absolute Discount value for the year 2017 as measures. The second data set has the new orders for the year 2018 with the total Order Value broken down by Customer. 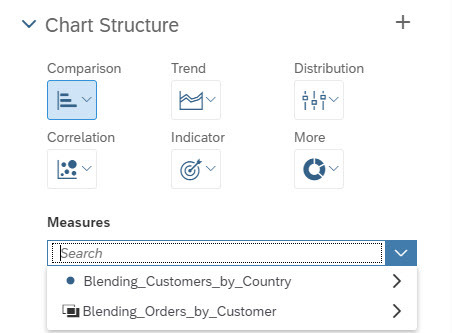 As we are focusing in this blog on the Blending portion, I am not going into details on how to create two models in SAP Analytics Cloud based in this information as that is already explained in several other sources. Total Order Value for 2018. So we start with a new story and we navigate to the Linked Dimension functionality. 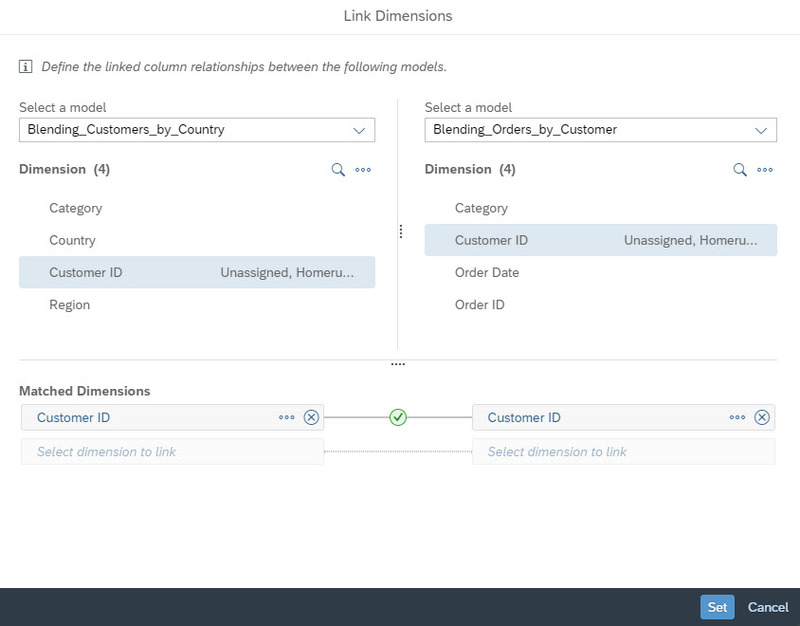 In the Linked Dimension dialog we are adding our model Blending_Customers_by Country as the model on the left hand side and we add the model Blending_Orders_by_Customers as our model on the right hand side. We then selecting the customer from both models to establish the link. Before we confirm the linking, we are going to make sure that the linking is done on the Customer ID. Make sure that you select the ID for both entries on Customer ID. After we confirmed the linking, we are back in the Story and we are adding a new Chart. 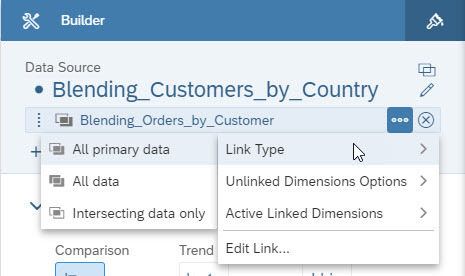 In the Builder panel of the chart on the right hand side, we select the model Blending_Customers_by_Country as the first model for the chart. Now we need to add the second model to our chart. We can use the Add Linked Models option. Because we already established the Linked Dimensions, our second model is listed and all we need to do is to select it. Now back in the Builder Panel for the chart we are starting to add Measures to our chart and because we have more than two models assigned to the chart, we can choose now the measures from both models. 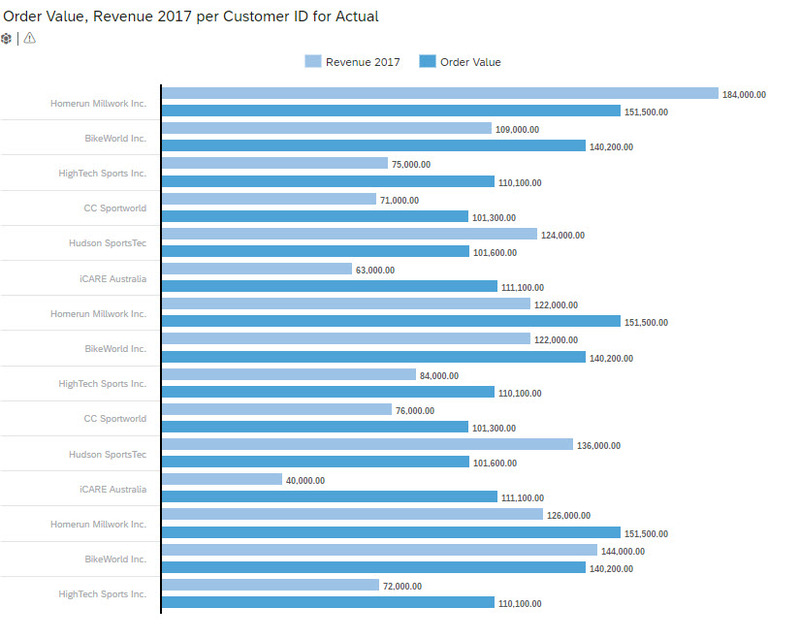 So for our first scenario we are going to choose the Revenue from 2017 from the model Blending_Customers_by_Country and we are adding the Order Value from the model Blending_Orders_by_Customers. As dimension we use our Linked Dimension Customer and we have our first chart with data shown from two models. 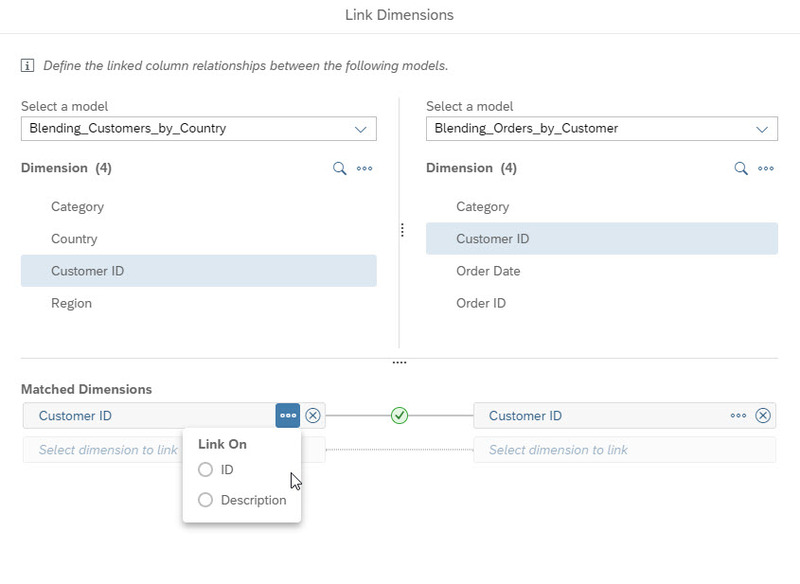 Because we are using two models in our chart, we also can configure the Link Type and we can also define which dimensions are being used as Linked Dimensions and which are Unlinked Dimensions (more on that in the next blog). All primary data – Allows all data in the primary model, and corresponding data in a secondary model to appear in the chart. All data – Allows all data in the primary and secondary model to appear in the chart. Intersecting data only – Allows only linked data to appear in the chart. Thanks for the blog. is it possible that blending with live connection? or is it possible only with import connection? yes – blending is possible with live connections. I tried to do planning using blending option from the above two models. But when I add a dimension from Customer model (Order ID) the Plan option is disabling and not allowing to edit the Revenue/Discount value . I have created two models which are plan enabled and included Version as Actual & Plan. Is it possible to do planning using blending option from two different models by linking unique dimension like (Customer ID in this example). Thanks for the detailed bog.Is there any option to combine two data set by Union.i.e I have two different data set with no common column,is it possible to union those two data sets? Can someone tell me where to find the files used for this exercise?